Let's talk about bags if you please. Bags are in the news these days. I don't mean San Francisco's ban on plastic shopping bags. Rather I'm thinking about this type of bag. In Ghana and most of West Africa we call it the "Ghana must go" bag. Alternatively in Ghana, and humourously, they are called "Efiewura Sua Me", literally "help me carry my bag". 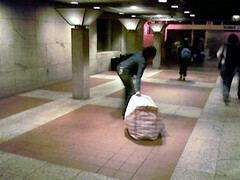 Indeed there's always someone at the bus or train station who needs help moving such bags. (And yes, I did help that young lady after taking a surreptitious snap with my dodgy cell phone. Chivalry isn't dead even at midnight at the bus terminal). Last year Sokari Ekine revealed her own bag woman tendencies and opened the discussion - she's a connaisseur. In response, Georgia Popplewell noted that "in Trinidad I’ve heard those bags called Guyanese Samsonite". We learned that in Germany, per contra, they are known as "Tuekenkoffer" or Turkish suitcase. In Boston I've heard them referenced as Chinatown totes, and called Bangladeshi bags in England, presumably after the 1970s influx of Bangladeshi immigrants. The "Ghana must go" designation resulted from the various expulsions of immigrants that Ghana and Nigeria engaged in between the 1960s and 1980s. Many were only able to pack their belongings in such bags before fleeing, expelled with barely hours or days notice. Thus Ghana must go is ironic at best, and has mocking overtones at worst. During the Rawlings Chain lean years in the 1980s when it wasn't simply a matter of returning immigrants and the whole country was facing political and economic difficulties (Revolution! Ghana), they were simply called "refugee bags". We were all refugees then. In any case, the trend in naming is clear, these utility bags designate immigrants, refugees, or those down on their luck. They are emblems of hardship, relative poverty and exigency. I'll argue here that they are object lessons about the fluidity of ideas. Let's first discuss the pattern. The majority of these bags are produced in China and it is fitting, given the interesting history of the pattern that covers them. The plaid pattern is thought to originate in the Taklamakan area in Xinjiang Uyghur in China perhaps between 100-700BC and certainly by the 3rd century. The Scots have the most famous claim to it however. The Falkirk tartan in 1707 is thought to be the Scottish debut of the tartan, the rich tradition of the Scottish plaid kilt that various families and clans adopted (this pdf shows a visual timeline of tartan). The Scottish colours are typically rich shades of red and green and only occasionally is the main colour white as in the bags. 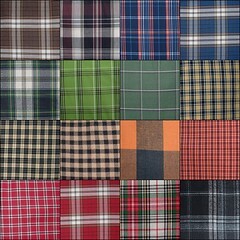 The word plaid means a blanket, from the Gaelic plaide. In North America people use it interchangeably for tartans. The etymology of the word tartan is itself in dispute. The French word tiretaine (an amount of material), and the Spanish word tartana (a fine quality cloth) are the main contenders. Now of course tartans were adopted wherever the British empire cast its wings. Bagpipes and kilts can be found from Ireland through Sierra Leone to India. I need only point you to this piece about tartans and turbans which lovingly traces their legacy in the Indian subcontinent and beyond. Amongst other things Ennis notes that Sikhs in Scotland have even commissioned family tartans; the headline for that episode reads: Singh Adds Spice To The History of Tartan. So: spice, the silk road and the Highlands. The Ghanaian artist Senam Okudzeto has very personal knowledge of the history of "Ghana must go" and has incorporated its iconography into her work. If you look at the fragments of her recent exhibitions, you'll be exposed to a history of dislocation, of fractured, sudden enforced exile. The question she raises is one of historical memory. Our plaid bags are the physical proof of the way in which the boundaries that meant nothing in our pre-colonial past now loom large in Africa. Indeed their name stems from the 1983 Expulsion Order giving illegal immigrants 14 days to leave Nigeria. But more broadly the bags refer to repeated upheavals in our lands and sub-Saharan Africa knows upheaval all too well. Still, there's a sort of existential defiance in her reclaiming these objects of loss. Divisions are embodied in the cheap, practical and functional bags. There is considerable wit in her work although it is always combined with a wistful displacement. Note the slogan, Capitalism and Schizophrenia, and some of the quotes she highlights: "deception is fundamental to the system". "I want to say one word to you. Just one word." If you are confronted with packing up your entire possessions in a hurry for fear of your safety, a Ghana must go bag will undoubtedly be a source of comfort. If you're trying to pack tins of corned beef and sardines, rice and sundry spare parts along with the clothes your relatives back in Ghana lack, you will gravitate towards the Ghana must go bag. At such times, volume and weight is everything. Ghana must go bags are about the most practical and lightweight luggage that exists. Plastic, rugged and functional, you can even wrap them with tape to ensure additional sturdiness so that they don't split when they are manhandled by underpaid bag handlers. You can place all sorts of foodstuffs in them: smoked fish, yams, meat and spices. And heck they are distinctive: plaid, woven and plastic. As such, they are fixtures in many routes serving the developing world. I wrote the foregoing to connect a few dots raised by a recent stir in Ghanaian newspapers. The headline read: Louis Vuitton sells "Ghana Must Go". The language of the style section is too clever by half but they captured the incongruousness and appeal of the image. A complex refraction indeed. A close look at a full slideshow of Marc Jacobs' creations shows that the bags of our tale were a leitmotif of the collection. This is nothing new in fashion; slumming is a trope in the rarefied heights of haute couture. In recent years we have seen much appropriation of the sort and things like service uniforms (UPS, McDonald's etc.) have gained a fashion quotient. This is run of the mill piracy and the kind of tongue-in-cheek sentiment we applaud our designers for. The author of the article was incensed that Ghanaians hadn't capitalized on the Ghana must go iconography and that others were now about to make hay out of a designer bag frenzy. A tempest in a tea pot in short. Of course I could have pointed out that a proud Ghanaian artist was blazing these trails long before Marc Jacobs got there. Indeed there is an element of theft in this episode. If you look at Senam's work, you'll also see that she focuses on the passport stamp along with the Ghana must go bag. She highlighted not just the bag, the few personal mementos, photos and such, but also the passport stamp. Those who didn't have the requisite stamp on their residency papers or passports were the ones who were forced into upheaval with only these bags to carry their belongings into the unknown. Thus issues of legitimacy and exile are part of the questions she poses in her ongoing series. In many ways, Jacobs's shtick was only a high-profile plagiarism. I expect Senam would be tickled by the nexus of commercialization and piracy that she likely provoked. The Akan proverb, humanity knows no boundaries, is one she would have been steeped in. Not to mention that the plaid pattern comes and goes used by all and sundry. The Wife notes incidentally that plaid is in this season in all the fashion magazines and stores. It was inevitable that others would latch on to it. In any case, what claim does Ghana have to Ghana must go? Shouldn't the Nigerians, who ironically coined the term, have first cuts of any royalties? Heck these bags aren't even produced in Ghana, we are mere buyers and users. Our Chinese friends manufacture them using their native pattern. And, as we have seen, our local name for the bags is not widely known outside of West Africa. We're not the only refugees, immigrants or attendees of the school of hard knocks. So to recap, a Ghanaian, by way of France and England, living in the USA, creates a collage starting with an image of Chinese-produced plastic utility bags taken by a Nigerian living in Spain - a 'theft' of the "Ghana must go" imagery, born of the interlocking episodes of reciprocal deportation and sundry exile between their two homelands, both former British colonies. The plaid pattern on said bags is originally Chinese although it is most celebrated in Scottish fabrics, and the subject of English schoolboy fantasies. Said pattern was transmitted in recent centuries over the corners of the British empire and is rightly part of Indian and especially Sikh heritage. This image is juxtaposed with a recent appropriation by an American fashion designer working for an France-based luxury company whose ironic contribution is to place a seal on the bag, contrasting the pennies on the dollar cost of the bag with a logo that is renowned for its deleterious effects on even the fattest wallets - a logo, moreover, that is often counterfeited by Chinese manufacturers in a global shadow economy of knockoffs that are sold all over the world. The significance of the logo or stamp of approval is iconic in expressing authenticity, legitimacy and belonging, demarcating the boundaries separating countries at once, and luxury status symbols delineating the rich from the poor. Incidentally this note was prompted by a posting by an Indian American, who is arguably more Ghanaian in sensibility than me from his few years in Ghana, said posting focused on the celebration of National Tartan Day by Scottish Americans and its implications for the Desi community and diaspora. I have just booked a trip to England. My ostensible purpose is to get a stamp in my passport that will keep my notional residency in Her Majesty's lands legitimate. I am hedging my bets against this American episode; the stamp is my soul insurance if you will. Refugees all, we in Africa are no strangers to dislocation, in many ways it is our close friend. As the song goes, wherever I lay my hat, that's my home. The percussion on this song, a stark array of milk bottles, proves that the boys still have it, appropriating whatever beat is expedient to get the message across. Who is that surrounding me? Milt Jackson's nickname was Bags. He is most famous as a pillar of the Modern Jazz Quartet, Django being only one of their numerous standards. Bags' Groove is a heavyweight encounter with Miles Davis, Sonny Rollins, Thelonious Monk, Horace Silver, Percy Heath and Kenny Clarke. He played his vibes and the rest is history. Bags and Trane is a more delicate affair, the two great soloists respected each other and are all empathy. I think Milt comes off better than Coltrane, much as Sonny Rollins came off fiercer in his Tenor Madness conversation with Trane. Movement of Jah people. 'Nuff said. A Prince album in all but name, the title track is sprawling like Bootsy and George would have done it. Oh identity. Their reunion in 2005, after 10 years apart brought such joy. (I still have a review in the draft pile). Let's hope they head back to the studio. I want some more nickel bags of funk. Herbie Hancock's contribution to this playlist is from the aptly titled Takin' Off album, an affair featuring Freddie Hubbard and Dexter Gordon mind you. This is hard bop at its best. Most airlines only allow two bags but when you fly Air Herbie, you get extra allowances for your baggage, and a bigger plane. I'll end with the bag lady herself. Ms Badu's Ghanaian heritage is only obliquely referenced these days, if at all; Texas claims her. Still, her musical iconoclasm is plainly mid-Atlantic, her sensibility is that of one who knows no boundaries, a musical refugee in her creative prime. This was the lead single from her last soulful album, the title of course: Worldwide Underground. A parting question: I wonder if this note could pass as a Things Fall Apart affair. Would it be a case of social living, a comfort suite or rather that rough beast? What say you dear reader? This was a fun read; thanks! I've been working on these bags for 7 years, read your blog and was blown away, I allways thought Louis Vuitton ripped me off, but thought it was my fragile artistic ego taking over... Sent the link to an academic friend. Her reply was , " who is this guy, he has a day job? I'm giving up academia to be a pastry chef! " Looking forward to the next installment..
For some reason I omitted to send a link to you, I'm glad you came across this bit of toli. And yes, "we wuz robbed" and quite blatantly too. The thing these days is that Google is the great equalizer. We're all telling our stories in whatever medium. The conversation cannot fail to move in our direction. This is interesting Koranteng. It would be one thing if the 'ghana must go back' was appropriated by Louis Vuitton, but the fact that Senam did similar artwork prior makes it even more frustrating and sinister. Intellectual property- who owns it? Modern Travellers: Ideas, People, Cultures, Plants, Objects moving in Markets. I have seen these types of bags in Chile, Peru, Argentina, Mexico, Guatemala, Belize, Thailand, the Philippines, Vietnam, and China. Over the several decades, that material in various stripe and plaid patterns has become so common in China. I have seen it there used to shade market stalls, made into large sacks to carry fish and crab, used as boat covers, draped over the back of cargo trucks and even as curtains in windows of shops and homes. Luggage made from that material is seen in every train station and airport in China. I see the Louis Vuitton bag as an artistic statement on the global ubiquitousness of this patterned material. These bags are indeed increasingly ubiquitous, as is their pattern. But even in China, it was the peasants that were the initial users, the promoters and the inevitably stereotyped. It's almost like a low end theory with an inexorable move up from the bottom of the pyramid of our societies. The naming is a very interesting matter. The bags only acquire their distinctive names as ironic commentary on immigrants or downtrodden. Elsewhere, they are nameless and merely functional. Historical memory is a funny thing, at climactic moments we latch onto symbols that resonate in their ubiquity. These bags are great repositories in this respect. I wonder if they do have other names in Latin America and East Asia or if they are simply without identity. For further fodder, I've noted some more bags to add to the photographic collection: Elia and Georgia P.
And on a different angle, I came across another bag lady this past weekend, one who fashions her bags out of recycled banners and garbage, the artist, Jenny Hurth. It's not plaid but it is a similar rescuing of memory. I hope she can connect with Senam at some point. They should have much to discuss. Very exciting read, thank you so much - merci beaucoup! I come from Liège in Belgium, were we had so many people coming from Ghana in the late eighties / early nineties; most of them went to live elsewhere, but I'm sure some stayed, even though the english spoken in Liège is quite rustic. My sister, who is a big user of that kind of bags, calls them "flight cases"; she herited the name from other people. There is an evident tongue-in-cheek reference to the total incompatibility of the bag with norms of in-flight (cabin) luggage. Together we even spoke once of the possibility of a future day of glory for this ubiquitous and sad object. Months ago, when I first saw the Vuitton bag, in a magazine, then on the net, the image of the runway was so small it was impossible to decide whether the bag was a leather version or a real bag, used as a ready-made prop(Thanks Marcel Duchamps! )in a ready-to-wear collection. You guess what I did then : I googled-imaged 'plaid bag', like you do in your post, and I came across so many flight cases, but no allusion to the Vuitton one. Later on, close-ups of said bag filled the fashion blogs and my question was answered. About 2 square meter made of leather woven in a tight and light sheet, for a bag that rests on the floor when you try to carry it (we're quite short in the family). For a bag that I can hide in! For a bag that always seems too expensive when it's made of plastic! For a bag that even the models already knew! Greetings from New York. Just letting you know that the local department store Pearl River has blogged about the Ghana Must Go (though we know it by a different name here in the Chinese community). We referred to your analysis of the bag's cultural-historical context. The post is written in a whimsical tone, but we tried to be meticulous about citing your research, in light of the previous scandal involving the infamous Liz Hunt. Good luck! 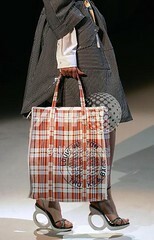 Hi Koranteng, you have no idea what sentiments were sparked in Ghana when Louis Vuitton showcased this bag. For most fashionista Ghanaians, it was another colonial invasion rip-off saga. But then again, we are used to claiming total ownership of what is originally borrowed and abandoning what is truly ours. Not that many people know that Java Wax Prints, GTP cloth, Vlisco or whatever you call them are actually not Ghanaian or African in origin but hey, that's another story.